Boiling Lean on Pete, the new film from Andrew Haigh (Weekend), based on the book of the same name, into a digestible summary can make it sound rather quaint and uplifting. A young teen, Charley (Charlie Plummer, All the Money in the World), spends his summer working at a stable whilst his father works long hours for a paltry wage. Whilst at the stable, Charley takes care of a horse by the name of Lean on Pete, who he becomes extremely protective of. When it becomes clear that Pete is going to be sent to the slaughterhouse, Charley runs away with the horse in the hopes of starting a new life with his aunt. Lean on Pete is an equine take on Ken Loach’s Kes, which will give some people a good indication of what to expect. When we first meet Charley, he’s a wide-eyed innocent kid who goes for long runs in the morning and is utterly devoted to his father, Ray (Travis Fimmel, Vikings). Ray does his best to look after his son, but the audience can see the cracks that are filtered through Charley’s rose-tinted glasses. Dad, for example, thinks nothing of having beer for breakfast, whilst discussing his sexual conquests with his son. In fact, when Charley comes into some cash and manages to buy a day’s groceries, there’s a flash of anger and resentment on Ray’s face, acknowledgment that his son has managed to do something he does not. Charley’s sudden windfall comes from the meager wage he collects off Del Montgomery, a horse trainer played by Steve Buscemi, who enters the film in a cloud of swearing and spitting. To Charley, Del’s lifestyle of going from deadbeat town to another, with his jockey Bonnie (Chloë Sevigny) racing his horses, is intoxicating. Once Charley enters his world though, Lean on Pete begins to chip away at Charlie’s naivety until he eventually absconds with Del’s least looked after horse. From here on out, the film continues to pummel and bash Charlie; seemingly punishing him for being so rosy-cheeked and innocent in the first place. He meets soldiers returning from Afghanistan, who regale with him horrific tales of violence. Later on, an encounter with a homeless man (Steve Zahn) leads Charley to tread down a violent path. It’s all incredibly bleak. Yes, a coming-of-age drama is supposed to set up hurdles and challenges for its protagonist. Yes, Lean on Pete offers up a portrait of American life often not seen within mainstream cinema. However, the film’s downbeat tone is stifling and relentless to the point it becomes unbearable, with two major events in Charley’s narrative being drowned out by everything else that happens around them. It’s a shame too, as Plummer’s performance is most certainly one reason to watch Lean on Pete. As Charley’s façade hardens, he manages to remind you we’re still watching a child with just a simple look in the mirror. Equally, the scenes he shares with Buscemi and Sevigny are the film’s best; the three characters congealing into a strange and problematic, but somewhat happy family. It’s fair to say that when the trainer and his jockey leave the film, they leave a huge gap in the narrative that’s tough to fill. Cinema is meant to challenge you from time to time and there is no doubt that Lean on Pete does that. However, when the credits roll, and we look back on where Charley started and where he ends up, you will find yourself asking what he did to deserve being put through all that hardship in the first place. 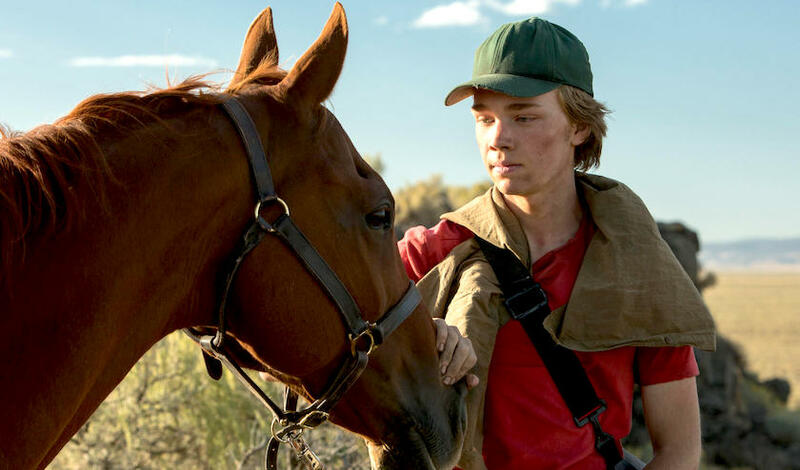 ‘Lean on Pete’ opens in Australian cinemas on November 29 and opened in the US on April 6. John Noonan is tucked away in a suburb of Melbourne. Aside from dissecting movies for numerous publications and guesting on commentaries, he is also the author of the Ms Holmes novellas. You can follow him at @noonanjohnc and noonanjohnc.com. 'Game Over, Man!' MOVIE REVIEW: A Painfully Smug & Unfunny Netflix "Comedy"